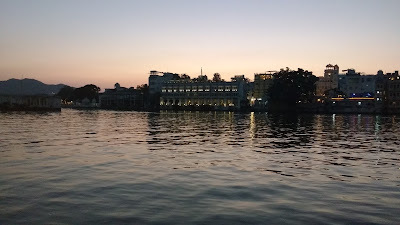 Udaipur was the second stop of my backpacking trip through Mewar and Hadoti regions of Rajasthan, done in the second week of January 2016. 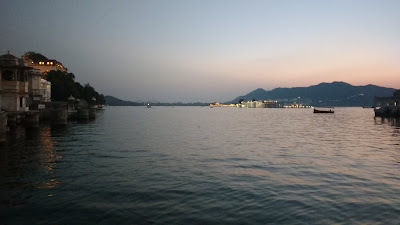 Udaipur - the erstwhile capital of Mewar - is one of the most popular tourist destinations in India, and for a good reason too. The city-scape defined by the two lakes - Pichola and Fatehsagar -, the beautiful palaces, temples and the ghats is beautiful in its own way. The narrow lanes of the old city are abuzz with tourists and the shopkeepers selling myriad articles greet you in smooth harmonic "Hello's". It looks like a fun place to be. My bus from Mount Abu dropped me at Fatehpura, close to my Hostel in Devali, after a four hour ride. My contact - nay, friend - from Couchsurfing also decided to join me and stay at the same hostel. We stayed here for two days (three nights) and covered a bit of Udaipur and Chittaurgarh. 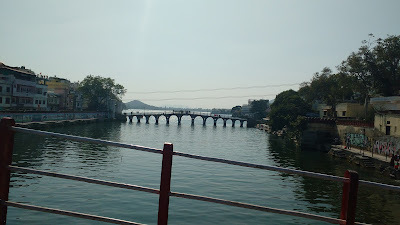 Udaipur is connected by road to most major places in Rajasthan, and India by extension. The rail link is good for people from Mumbai. 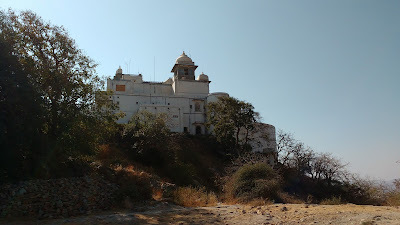 The Monsoon Palace - also called Sajjangarh - was the first place we went to. Located on a hill on the western side of the city, the palace was built by Maharana Sajjan Singh in 19th century to keep a lookout on the monsoon clouds that would bring rain to the city. The palace was also used to keep a weary eye over the old Mewar capital of Chittaurgarh - then fallen under Delhi - visible on clear days. The entry tickets are Rs. 50 per head, plus a return 10 km jeep ride for Rs. 90. Yes, the hill is 5 km away from the entry gate. We transferred from one palace to the another - this one much bigger, grander and awesomer than the former. The entry tickets for the palace are Rs. 250, plus another Rs. 250 for the camera. The tickets for the 'Crystal Gallery' and Pichola Lake are Rs. 500 and Rs. 750, sold seperately. 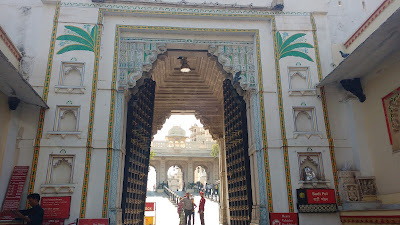 The first ticket only covers the entry to the palace myseum which is a labyrinthine maze featuring arts which received a royal patronage in Udaipur. The palace is built such that each successive ruler added something substantial to it to mark his legacy. It takes a minimum if 2-3 hours to cover the city palace museum. And, I did not opt for a photo-pass, so no pics here too. Go and see it for yourself. The Garden Restaurant is an overpriced place to eat, but serves surprisingly good food. 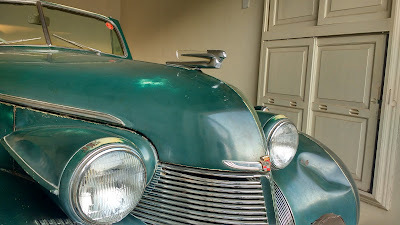 The nest part is that it is located next to the Vintage Car Museum. 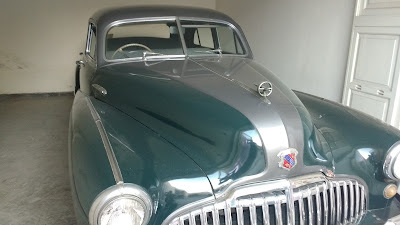 This is a collection of cars that were brought by, used and preserved by the royal family of Udaipur. 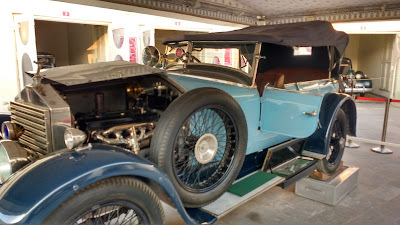 The cars on display feature a variety of logos like Rolls Royce, Buick, Mercedes, Chevrolet, Morris and Cadillac. 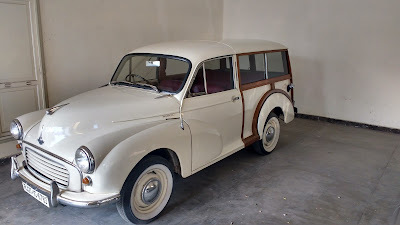 The entry ticket of Rs250, though can be justified by car-lovers only. There is a municipal garden next to the museum. The garden is superb. albeit a bit overgrown at places, and makes for an amazing place to relax in the core of the city. 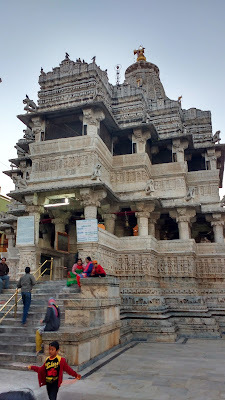 This 17th century important temple is located next to the city palace. 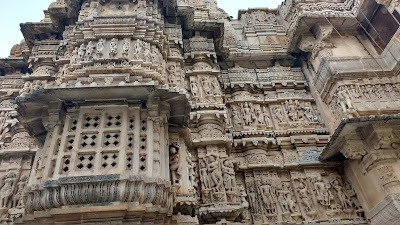 The temple features some stunning artwork and also is a much revered site for the locals. 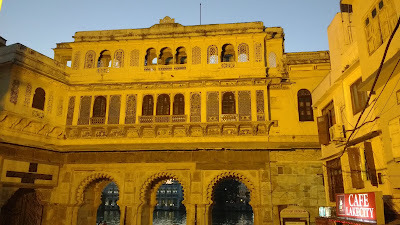 This ghat on the Pichola gets its name from the Gangaur festival for which this ghat serves as a venue. Its a good place to sit and watch the evening lights over the Pichola. The museum was closed by the time we reached there. Both these lakes are artificial, man-made lakes and serve to maintain a healthy water table in this typically dry land. 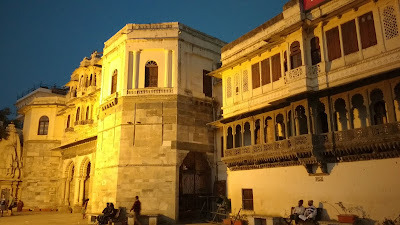 The Pichola is located close to the old city centre. One bank of the Pichola is shadowed by the mighty palace walls, while the opposite bank is home to swanky hotels; speaking of which, the Jag Mahal - or the island palace - deserves a special mention. 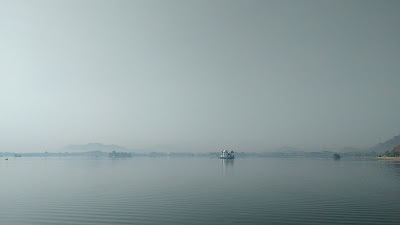 The Fatehsagar Lake is in the newer, north-eastern part of the city. The city-side bank of the lake has been converted into a nice car-free promenade where the locals can spend a relaxing evening. The lake also has three islands, two of which are used as parks while the third has a Solar Observatory. This is the Backpacker Panda - our hostel, located in the Devali area, next to the Fatehsagar Lake. The hostel is located in a residential area and a bit far from the main attractions of the city. The criss-crossing alleys also make it a bit hard to locate, however Google Maps can be relied upon for the perfect route. The hostel itself is quite new, inaugurated in the later part of 2015. The hostel is top notch in terms of amenities and facilities with an impressive decor. John (a.k.a. Siddharth), the manager, is a friendly and helpful guy and also prepares top-notch Maggi. Plus, they provide you with a Panda-Map and bicycles on rent to explore the city any way you please. If you ever happen to go there after reading this, do pass my regards. Oh yes, the best part is all this costs a maximum of Rs. 450 per night if you opt for a bunk-bed and you get to meet a bunch of other travelers too. 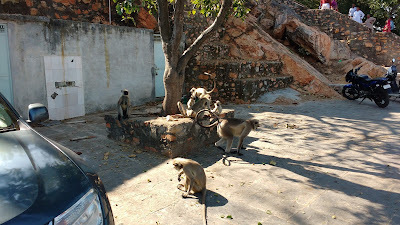 That was all I could cover in Udaipur, sadly. All I could spare was just one day in the main city. There's probably a lot more to do in the city and a lot more to explore too. 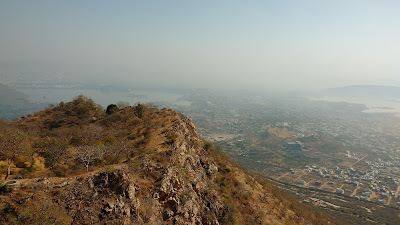 A hike up the Neemuch Mata temple, the rope-way rides and boat-rides in the lakes are also pending. Just walking through the narrow lanes of the old-city would be much fun in itself. All those latent plans will have to be shelved till I return here, sometime in the near future. Hey Kapil. It was a pleasure hosting you at Backpacker Panda - Udaipur. 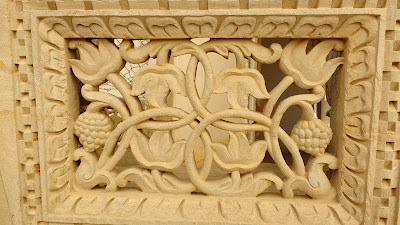 We are delighted to see us here on your post. A big thank you from the entire Panda Team. Hehe - the hostel is cute, so its kind of ok to be called a panda. I wonder what would happen if they open up in the East - BackpackerPanda = BackpackerPriest, sounds good!